Lock in a great price for La Boheme Bajo – rated 8.2 by recent guests! Wonderful staff! Very helpful and friendly. Great communal bohemian feel. So very chill. The common areas were great. The overall atmosphere of the place was fun. It was a quick walk to the main Street. A good pace for younger travelers the staff is very kind and you can get pretty much everything you may want to do on the islands here. Food is good and the beer is cold. The staff were very friendly and helpful whenever their assistance was needed. Good location. The hostel provided water throughout the facilities with breakfast and tea/coffee all day. They also offered trip bookings at a discounted or competitive rate than what was offered throughout the town. THE STAFF JUST AWESOMEEE! 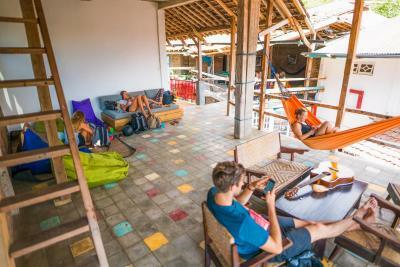 the best hostel i've experienced! kuddos to all staffsss! 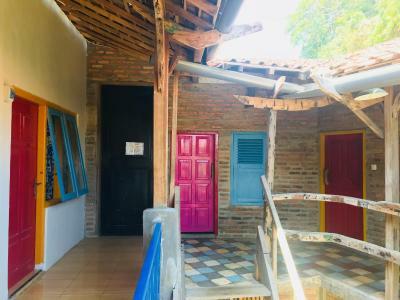 very affordable and has a good location, you can see bajo sunset right in the front this hostel just 💯. the breakfast was good! you can drink tea, coffee, mineral water for free everytime. i love this hostel and gonna comeback with this friendly vibe experience. the guest will mingle, so good for solo traveler. the bathroom was sooooo clean and the night vibe i love it so much because of the lighting and everything. Very nice atmosphere and common areas. Close to restaurants and not far from harbour. Bathrooms were clean and comfortable. Pancakes available all day long! Comfortable beds and nice lockers with electrical outlets. 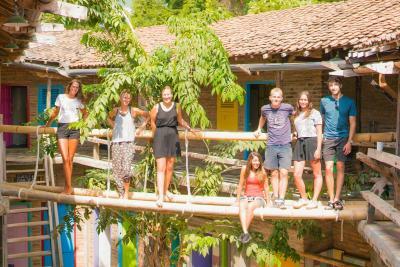 Fantastic staff and plenty of hammocks and bean bags to hang out on. Really nice and affordable restaurant with both local and western food. The fish especially was very good, on par with the fish market. 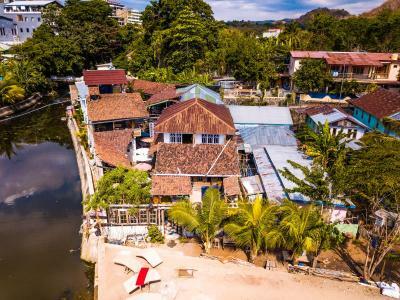 La Boheme Bajo This rating is a reflection of how the property compares to the industry standard when it comes to price, facilities and services available. It's based on a self-evaluation by the property. Use this rating to help choose your stay! One of our best sellers in Labuan Bajo! Located in Labuan Bajo, La Boheme Bajo has free WiFi. Featuring a 24-hour front desk, this property also welcomes guests with a restaurant and a grill. The tour desk is available to assist guests in planning their days out. 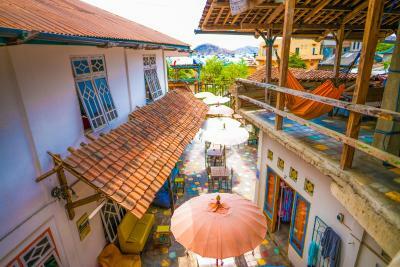 Featuring a shared bathroom, some rooms at the hostel also offer a terrace. A buffet breakfast is available daily at La Boheme Bajo. The accommodation has a playground. 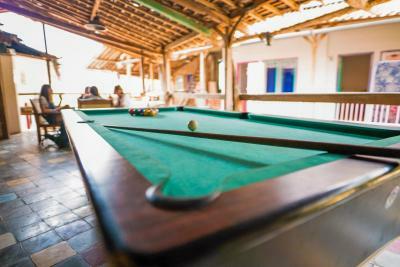 You can play pool at La Boheme Bajo. The nearest airport is Komodo Labuan Bajo Airport, 1.4 miles from the property. 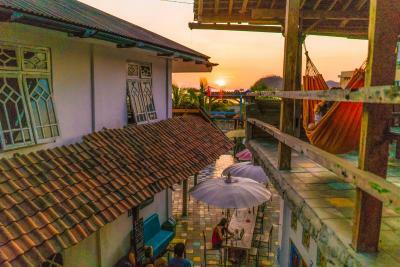 When would you like to stay at La Boheme Bajo? This bed in dormitory has a CD player, tea/coffee maker and air conditioning. This double room features a CD player, seating area and air conditioning. House Rules La Boheme Bajo takes special requests – add in the next step! The door of our dorm couldn’t be closed so had to be left wide open. And both times I checked in I had been assigned to a bed and then when I came back later that night, they had assigned another person to the same bed and they had thrown my stuff off. Other people had had the same problem, I think the organisation of bed assignment could be better. The free breakfast of pancakes was a nice bonus, the staff was very nice and helpful and the atmosphere was good. The pingpong table and the pool table were a nice touch. If you are traveling with heavy luggage, the location can be a bit of a pain. It is not on the main road, but back a bit on a tiny side potholed alley. Really nice and helpful staffs, great vibe there! The bed was really hard, bring earplugs for the call to prayer at 4am, wifi only available in common spaces. Nice location, cool space. Staff is great and really helpful! Great they had refillable water, breakfast and a restaurant on site. There are pancakes available from 5AM to 4PM which also are the breakfast provided and had banana to accompany them - I don’t like bananas so plain pancakes weren’t that great. There is only toilet paper if you ask for it, otherwise the bum gun it is! The water pressure isn’t great in the showers and they are only cold. Don’t expect to get too much sleep while your here unless you bring your ear plugs as it is very noisy at night with others in the hostel, families who live around the hostel and of course the call to prayer at 4:30AM. There is A LOT of trash just outside the hostel on the streets and the harbour which is slightly off putting but not the hostels fault. The wifi didn’t work in our room - and barely worked anywhere else except sitting right next to the reception. 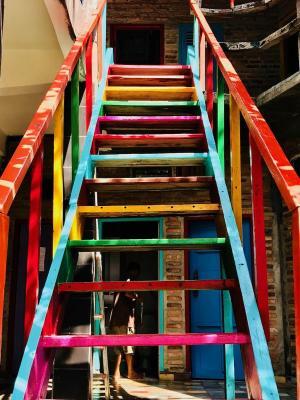 Everyone knows of the hostel so it is easy to ask about and find! The rooms were basic but clean with aircon. The restaurant on site is great - the pizza is particularly good! The staff were super friendly and will help with anything! Easy to book trips and taxis to the airport etc. There are plenty of bathrooms and places to chill out! And there is cold water machines where you can have a glass or fill your bottle for a small charge - not something we are used to seeing! There is also a small kitchen if you do wish to cook for yourself! Very close to the Main Street and all the dive shops, restaurants and harbour where all the trips leave from. There is also something happening each night - like beer pong, movie night, etc. We didn’t join in on any but it seemed quite a lot of people did! La Boheme is a really great place, you can make your own food or enjoy the 24/7 pancakes. The Bathrooms are good, and there are some cozy places to chill the day. We really enjoyed the snorkeling trip, I even saw a turtle. The staff is really friendly and helpful. The bed was just a little thin and there could have been soap in the soap dispensers. Overall, was a good place to stay. 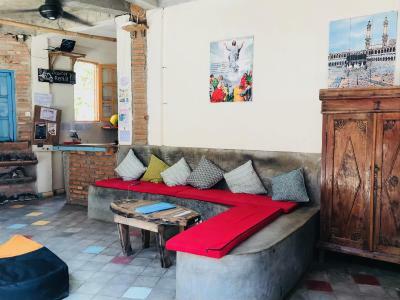 Lovely hostel located close to town. Enjoyed our stay here very much. Very nice vibe and super friendly staff. The common areas are very nice and clean. You can use the open kitchen or eat at the restaurant of the hostel, which is also nice and good. Dorms are...dorms! Basic and clean! Lots of bathrooms around the building, no hot water. The eight person room was very crowded with no room for luggage if you were in a top bunk. Also, the top bunks didn't have a curtain on all sides leaving your bed open to the next bed over. Breakfast was not worth eating. It was a bit difficult to get to from the closest street with luggage. The breakfast is always banana pancake and if you want to have eggs or something different you have to pay extra. The rest was fine! 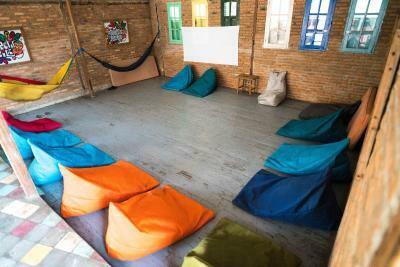 Great hostel to chill with friends or meet new people. The common area is very nice! The staff is helpful and there is both laundry service and scooter rental. The beds were comfortable and there are many toilets and showers. Recommended! Cold water showers- hot water would be nice!